Remember that I am currently offering winter/holiday pricing over at Trout Zone Anglers. Once you book, the pricing is valid on any trip through the end of February, but I will not be offering the reduced pricing that whole time. In other words, the sale may go another day or it may go another week, but if you want one of the best deals around on a guided trip, don't wait too long. Along with everyone else, I decided to get my 2014 Year in Review finished and published here at the Trout Zone. First, thank you to everyone who stops by and reads and comments here. Also, thank you to all the great people who have supported me in my new endeavor as a fly fishing guide. That said, let's look at 2014. This year has been a transitional year. Leaving behind the teaching profession was difficult as was leaving a place and friends I really enjoyed. In many ways that made the end of 2013 and 2014 the toughest time of my life. However, the opportunity to dive headlong into the fly fishing business as a guide was a lifelong dream come true. At this point, I'm not sure what the future holds. At the very minimum I'll still be guiding some on the side as I'm not sure if I'll end up back in the classroom or not. If guiding continues to be a full-time career, you won't hear any complaints from me. On my first day as a guide in 2014, I looked around as soon as we hit the water and thought, this is my office now! Here on my blog, the last trip of 2013 prompted my first post of 2014. 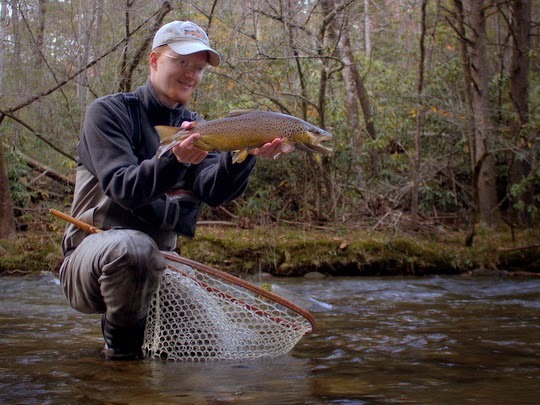 A cold weather Smokies trip resulted in a beautiful brown trout that ate a streamer, in other words, my kind of fish. Later on in January, I had the pleasure of both reviewing Matt Supinski's book Selectivity as well as interviewing the author by phone. What a pleasure to talk to someone who appreciates finicky fish as much and probably even more than I do! 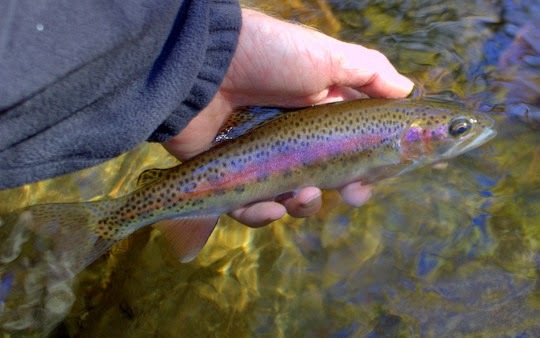 By the end of January, Trout Zone Anglers was born. In February, I made a last trip back to Colorado to visit friends who would soon be moving on out of my life. 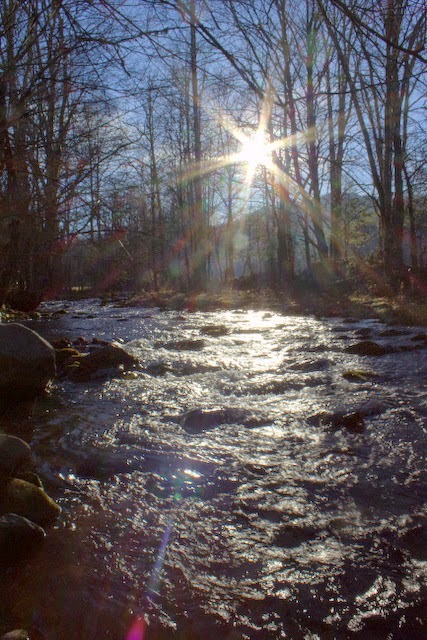 The chance to return to South Boulder Creek was too good to pass up, and I enjoyed some great winter fishing without ever getting my feet wet. Back in Tennessee, we were stuck in the polar vortex that delayed the spring hatches and generally wreaked havoc with the early season fishing. There were fish to be caught, but it wasn't as easy as some years. 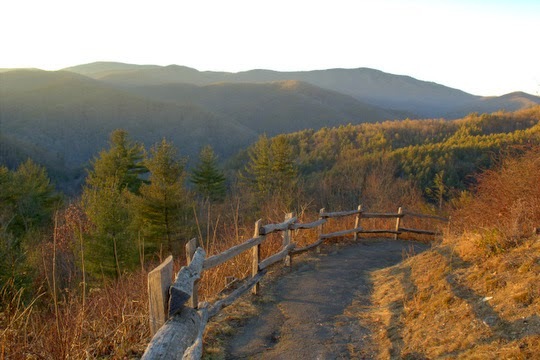 By late February, all the paperwork was completed with the National Park Service to officially guide in the Smokies, and I started taking bookings. In March, the cool weather kept the fishing in the marginal category but we started to see bugs eventually. 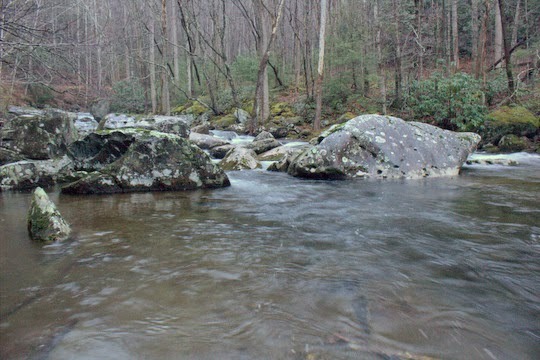 Trips to Smokemont as well as some closer to home kept me busy until I started doing guide trips by late in the month. April continued with much of the same. High flows on the tailwaters early in the month finally started to give way to some windows of opportunity for both guide trips and personal fishing excursions. Dogwood winter brought a return of the polar vortex, but by and large the month was a little better than the previous 2 months in terms of nice fishing weather. One of my favorite trips in April was a guide's day off trip down to the Caney. I had always heard about the run of buffalo but never experienced it for myself. That all changed when I hit the water with hundreds of huge fish everywhere. What a trip! May was one of the highlights of the year for me. 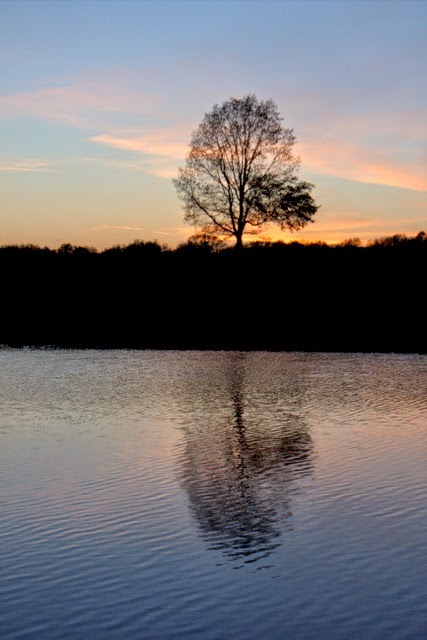 Tranquil evenings chasing farm pond bass, perfect flows in the mountains to catch trout, generally one of the best fishing months in Tennessee, it produced both good fishing as well as some opportunities to give back. One of my favorite opportunities in May was to help with a Casting for Recovery Event. It was a lot of fun and I hope to make it back again this year. Another highlight of not only the month of May but of the whole year was the chance to camp for a couple of nights up in the Smokies with my buddy Joe McGroom. 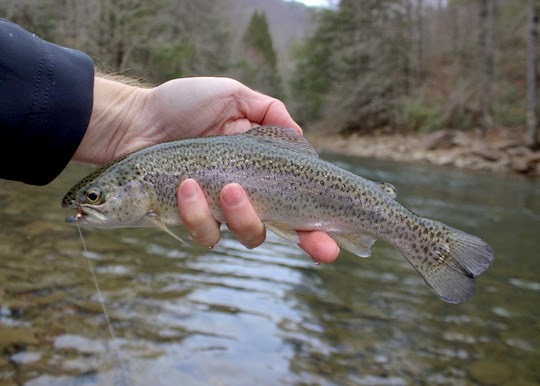 We have fished all over together including Colorado, Yellowstone, and of course throughout east Tennessee. One of my oldest and best fishing buddies, Joe is one of the best fishermen I know and always fun to share the water with. Another great trip in May included a Caney trip where I found some carp. 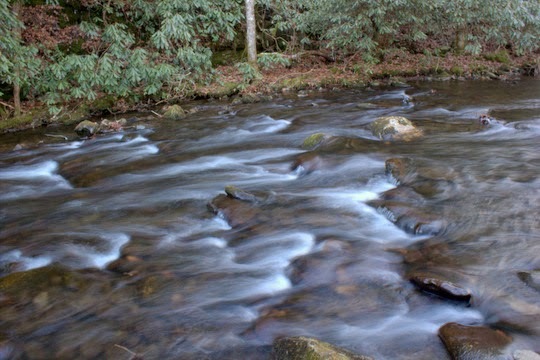 By the end of the month, Trout Zone Anglers had added a new trip option, float trips! Yes, a drift boat was added to the arsenal. 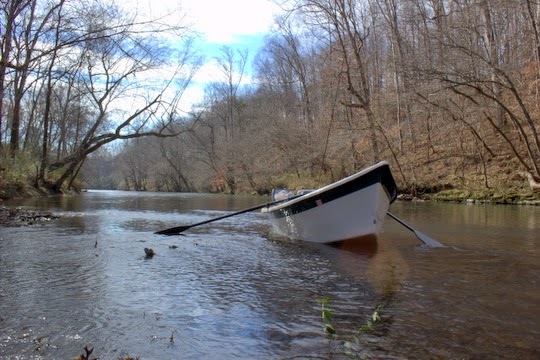 An older boat, it nevertheless did everything that I needed a drift boat to do and was soon put to work taking anglers down the Caney Fork River. 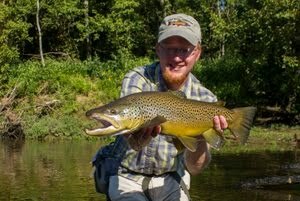 Lots of other great guide trips happened in July. One beginner trip was especially noteworthy when a first time fly fisher landed close to 30 trout in one day. That is a good day regardless of your skill level and even more impressive with someone new to fly fishing. He even caught a double at one point. Those are the days we live for both as anglers and guides. Late in July, my cousin Nathan came to visit. We have fished together for more than 20 years and always enjoy the chance to get out on the water. 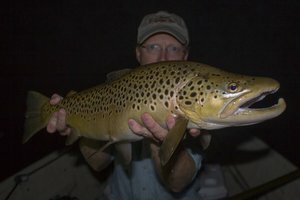 Between a Caney Fork float where I hopperized a big brown and a couple of nights in the Smokies, we had one of those highlight trips that I'll remember for a long time. 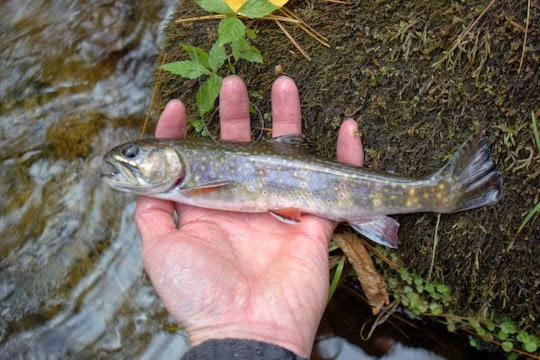 In August I was still chasing smallmouth in between lots of guiding, but things were busy enough that I started to slack off a little here on the blog. By September, jokes that I had been making about an early fall as far back as June were looking more serious. 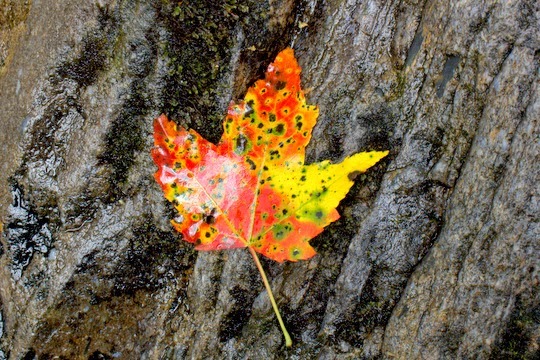 Beautiful leaves were showing up with regularity on the streams. Part of that had to do with the slightly drier than normal year we had in east Tennessee. October saw the normal peak colors in the Smokies along with the usual excellent late season fishing. I caught some of my largest Park rainbows in the fall burst of great fishing. 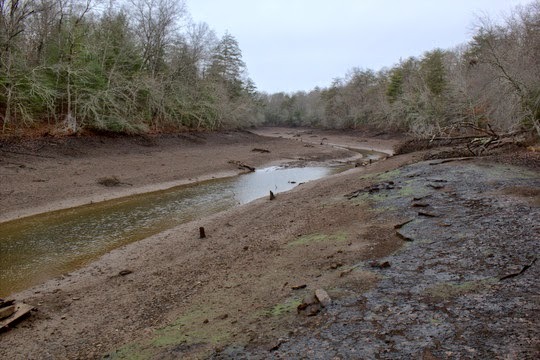 High water returned as the norm on the Cumberland Plateau which meant that the Caney Fork River would rarely be fishable for the rest of the year. 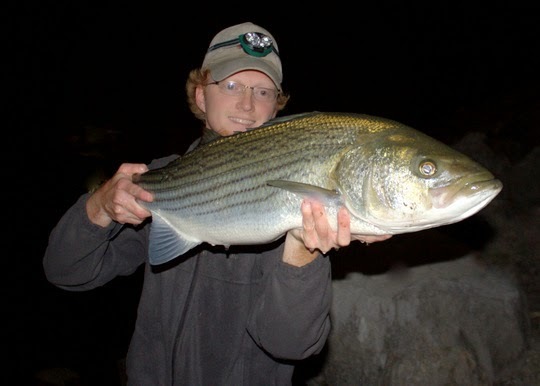 Striper fishing was spotty this year but I eventually got one in October. November brought an early winter with snow and cold temperatures. 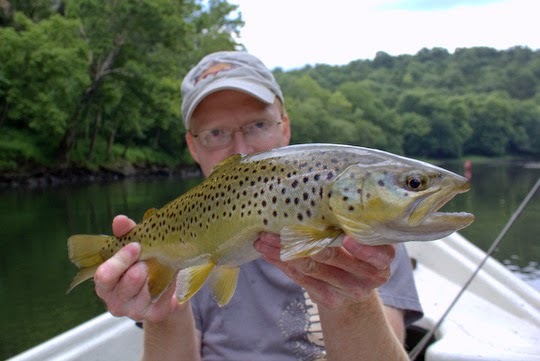 For my birthday I managed to find a big Smoky Mountain brown trout that would eat a streamer. The highlight of December was getting my buddy Dan Muenger out after some musky and putting one in the boat on his first ever musky trip. I can't take all the credit as he is an excellent angler and stuck with the game plan for a long day of tossing big flies. Trips to delayed harvest streams kept me busy in between the events associated with the holidays. 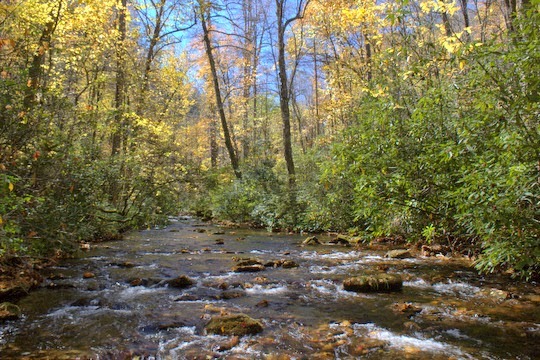 One last guide trip at the end of the month allowed me one more chance to fish in the Smokies. After putting all three new anglers on their first few trout, I headed back out and caught double digit numbers of fish in the last hour and a half of daylight and was reminded how important water temperature is this time of year. So there you have it. 2014 has been quite a year but as much as I've enjoyed starting a guiding business, I am looking forward to a New Year and hope for a much happier 2015. I plan on fishing as much as possible and continuing to build my still young guide business. The west is still calling me and if gas prices stay low, I may head that way at some point this year to relax and enjoy the wild country. I hope each of you has a great 2015 and that you can spend even more time out on the water! Thanks for being a loyal reader and supporter of the Trout Zone. Winter fishing does not have to be all about frozen guides and numb fingers. In fact, if you choose your moments, the fishing can be as good as during the warmer months. This fact was driven home yesterday on a guide trip I had in the Park as well as afterwards when I fished a bit for myself. Guiding in the winter can be a tricky proposition. The generally cold water temperatures and sluggish trout means that the catching can be tough even for the best of anglers. Over the last few days we have experienced a welcome reprieve with water temperatures at the Townsend USGS gauge flirting with the 50 degree mark yesterday. That is almost always a good thing, especially this time of year. When we hit the stream for a half day trip starting in the late morning, I was not sure what to expect. When 2 of the guys had fairly hard strikes early on I was feeling better. Getting new fly fishers on fish can be tough, but when the fish are hitting hard it helps a lot. We finally hit up a pool that always holds a lot of fish and really started to do well. In fact, the three guys took turns and caught a total of 6 fish out of that one hole. The lesson there is that when you find fish in the winter, there will probably be several. Wintering holes will have a lot of fish stacked into a small space. 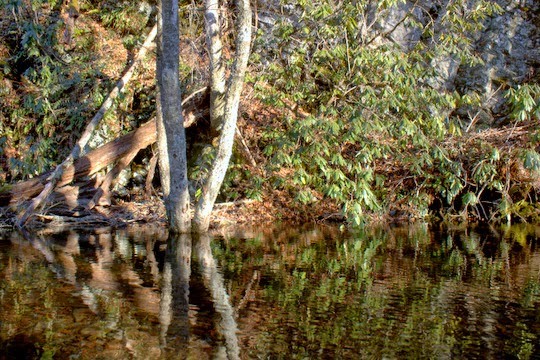 Look for deep water with moderate to slow current with easy access to food. By the time the guys had each caught a couple, I decided to head downstream to another section to see if we could find water where they could all fish at the same time. We got on a few more good spots and landed another trout before we had to call it a day. It was at this last spot that I started seeing the bugs hatching. Midges were everywhere and some caddis were making an appearance as well. I even thought I saw a mayfly but was not positive on that. 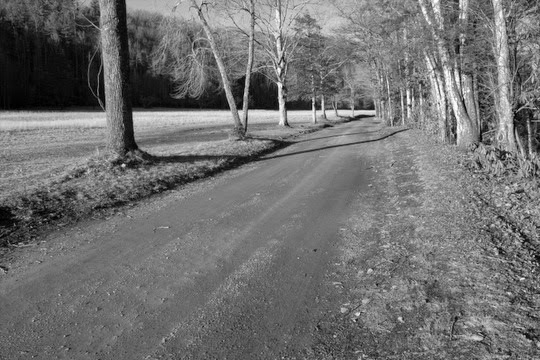 After dropping the guys off at their cabin and stopping by Little River Outfitters to see Daniel and Bill for a few minutes, I headed back up to the Park to see if I could scare up a few myself. Sure enough, it didn't take long before I was catching trout. Over the next hour and a half, I caught and released 17 trout. The fishing was so good that I decided to see what they wouldn't eat and tied on a Green Weenie. Sure enough, I kept catching fish. I even had at least 2 solid strikes on the strike indicator which tells me that I could have caught at least a few on dries. So, the other lesson for the day was that warm water will almost always be a good thing in the winter. I think the best part about the water temperatures yesterday though was the fact that they had risen gradually and didn't need a big push of rain water to help them climb. The fish were feeding like it was their last meal. Maybe they knew it was about to get cold. The temperature has been dropping steadily ever since and will through at least tomorrow. I'm just glad I got to be there on such a good day! Earlier this week, I was over on the south side of town and decided to make a run by Cumberland Mountain State Park. The rumor that the lake was to be drained had me wondering if it was empty yet as well as wanting to figure out why they were draining it this time. My first glimpse confirmed that it was drained. I've seen it drained several times over the years and this one was as low as I have ever seen the lake. As it turns out, that is a good thing. For many years, in fact for basically my whole life, I have been enjoying this Tennessee state park. Byrd lake, while not large, provides decent fishing as well as a great environment for seeing birds and even some good wildflowers in the spring. More often than not, when I just want to get out of the house, I'll head over to Cumberland Mountain SP and enjoy a walk around the lake. For most of my life, there has been a footbridge over the lake at the boat dock. On the other side a trail extends up into the woods to the swimming pool. Additional trails loop around the lake and the footbridge provided an important cutoff to keep the walk from being too long. Imagine my shock when the bridge was gone. Here is a shot from the first time I saw the bridge missing. On Tuesday, after taking some pictures of the lake, I stopped by the Park office to see if anyone was around who could tell me the details of what was going on. Sure enough, I was lucky enough to catch one of the rangers in the office. Monica Johnson has been working at Cumberland Mountain State Park for several years and kindly answered all of my questions and even a few I didn't know I had. Looking up the lake from the boat dock. Looking down the lake from the boat dock. Check out that structure on the left! First and most importantly, the lake should be brought back up to full pool sometime around the end of March or in April. The exact time depends on when they complete their work. They are hoping to rebuild the footbridge across the lake. Yes, that is GREAT news! 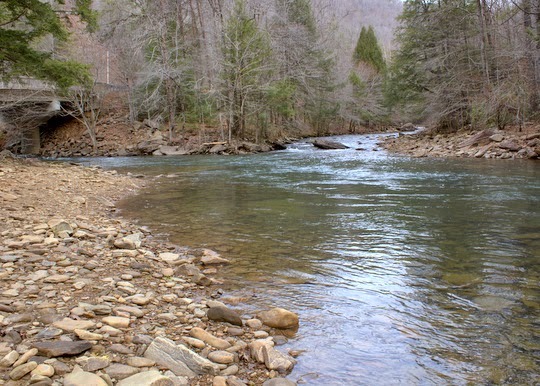 Local trout anglers have been inquiring if the trout stocking will happen and according to Ranger Johnson, the stocking is tentatively planned for sometime in February. 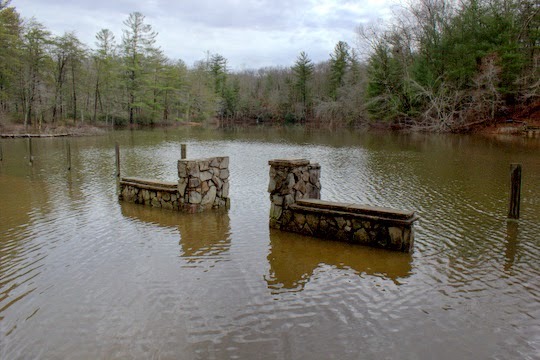 This all depends on the progress of the bridge building project of course, but once the supports are set in the lake bottom, the overall lake level can be brought up somewhat which should allow the yearly stocking of rainbow trout. If fish are stocked in February, we will have at least 3.5 months of fishing before things get too warm. As a fisherman, I find the low lake level fascinating. It allows you to examine a lot of great underwater structure and plan future fishing trips. 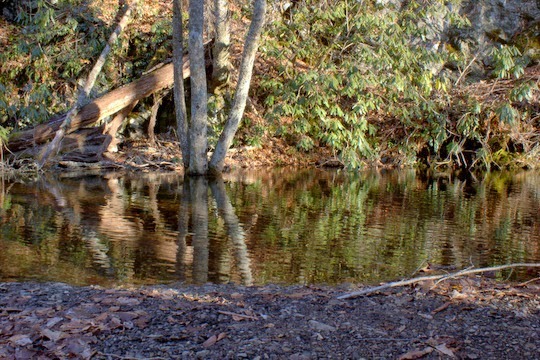 I have identified some good drop offs that I plan to fish with sinking lines sometime in the summer. There is the dam. See how low it is? While I was getting my questions answered, I also asked about some rumors that have been going around in regards to privatizing the Park. Depending on who you were talking to, the plan was for the Park to become a private entity charging for any type of entry. Naturally, those of us who have been enjoying this Park our whole lives were not happy to hear about that. Ranger Johnson informed me that they are currently exploring the possibility of having certain aspects of the Park privatized. A good example of that is the General Store at Fall Creek Falls. In other words, the overall Park will still be there and those of us who enjoy hiking will still be able to hike. 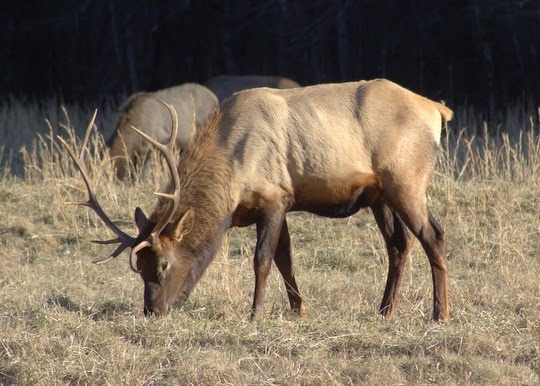 The Park itself will still be a State Park but some things might be run by a concessionaire, much like many of the amenities in Yellowstone National Park or many of our other great National Parks. Theoretically it should allow for better services and allow the Park to focus on improving the visitor experience. Considering that our state parks are free here in Tennessee, I think this is a reasonable tradeoff instead of instituting an entrance fee. As with most parks (both state and national), our state parks are generally understaffed and underfunded and each park is doing a remarkable job considering the resources they have available. This brings me to the last item which is how you can help. As I just mentioned, state parks are generally short on both funding and staffing which makes it difficult to keep up with everything that needs to be done. Helping out is quite simple. All you need to do is stop by your local state park and let them know that you would like to volunteer. You will need to fill out a volunteer form and then they will put you to work. I'm planning on doing some trail work here at my local state park in the coming weeks. With a considerable amount of free time in the cold months as a fly fishing guide, I have plenty of time to help out and give back to a local park that has provided countless hours of enjoyment throughout my life. If you appreciate your local park, I recommend finding the time to help out as well. Merry Christmas and thank you for being a part of making 2014 great! I appreciate everyone who stops by here at the Trout Zone and reads as well as those who leave comments. Also much thanks to all the great people who fished with me this year. I have enjoyed guiding as much and even more than I thought I would and look forward to a fantastic 2015. Thanks for stopping by! I would specifically like to thank a few people who have supported me in various ways from offering advice, mentoring, and helping me get my business started, to referring customers my way and getting out word about Trout Zone Anglers. Specifically, I would like to thank my friends David Perry of Southeastern Fly, Josh Pheiffer of Frontier Anglers, and Captain Michael "Rocky" Cox of Rocky Top Anglers. Also I would like to thank Daniel Drake and Byron Begley of Little River Outfitters for supporting me in this new venture, being there when I needed advice, and helping get out the word about my new business. Thank you all and Merry Christmas! One of my favorite places to fish during my college days was the Tennessee River in Chattanooga. I could be on the water with only a quick 20 minute drive at a moment's notice. One of the more intriguing aspects of this fishery, at least for me, was the great variety in species available to the fisherman. 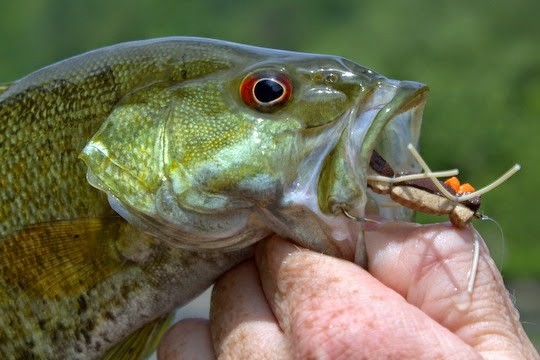 Largemouth and smallmouth bass, white and yellow bass, stripers, drum, catfish, crappie, bluegill and other panfish, and let's not forget the skipjack, all inhabit the river (along with a lot of other species). In the winter, there would often be some phenomenal shad kills that brought on some good surface eats. In general, you can almost always catch something on the river. So when I had plans to be in Chattanooga for a couple of days last week, I naturally decided to bring along a fly rod, just in case. Sure enough, some time was free one afternoon, and I quickly jumped at the opportunity. Arriving at the river, I rigged up quickly with a 7 weight rod and full sinking line. 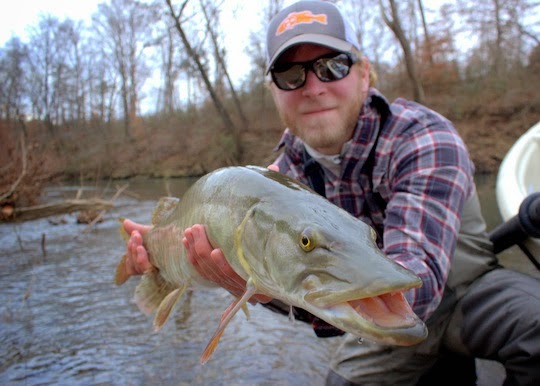 A short leader of 12 pound test fluorocarbon led to a white Stacked Blond. Trailing behind that I had a small weighted marabou streamer that has been very successful for me over the years on warm water rivers. In the past, I would have caught most of my fish on the smaller of the two flies, but for this trip the larger Stacked Blond in white did the trick. I managed a couple of white bass and one small yellow bass. The local Blue Heron population is alive and well. Watching these birds is always entertaining so I spent some time just enjoying and of course using my camera. Invariably they are much better and more patient fishermen than I am. I had obligations and couldn't stay long. A quick 45 minutes went by all too quickly but I'm already looking forward to another chance to fish there. Hopefully that will happen sometime in the next couple of months. Before I know it the white bass and skipjack will be running and spring will be here. This year I have easily set a new personal record for most visits to Cataloochee in a single year. Last weekend I traveled to Asheville to visit some friends. 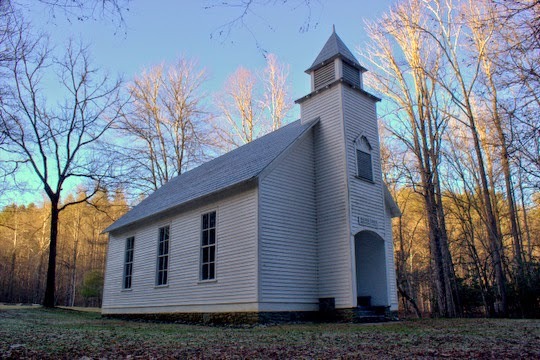 On Saturday afternoon we made the drive over to Cataloochee. 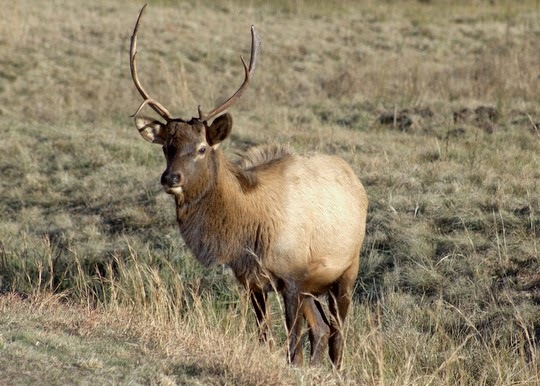 They had never been and I wanted to show them the elk and the historic buildings, not to mention the overall scenery. Here are a few shots from The Return. Here in Tennessee, it looks like we are set to pay more to fish and hunt. Taxes on most outdoor activities that I care about are about to go up. Remember, once the government gets a tax from us, it is very rare to ever go back the other direction. Sadly, as a trout fisherman, I don't believe the increased cost is justified by the quality of the fishing. There are several important things wrong with the current proposal, at least some of which I hope we can get fixed. 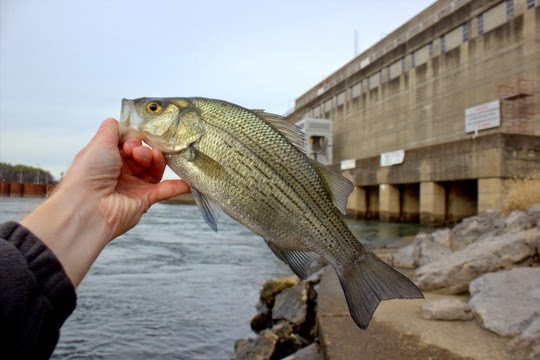 First and most importantly for out of state anglers, the Tennessee Wildlife Resource Agency (TWRA) is proposing eliminating the one day fishing license for non-residents. To put this into better perspective, let's look at a scenario where you decide to come take a float with Trout Zone Anglers. As things now stand, you can purchase a one day all species license for $16. Not bad for some decent trout fishing. Under the new proposal, TWRA wants to eliminate the one day non-resident license. The next cheapest alternative? A three day all species license. Guess how much that is going to cost you? Seriously, you don't want to know but this is so important that I'm going to tell you anyway. $40.50. Yeah, ouch. That is a LOT of money considering that is what North Carolina currently charges for an annual non-resident fishing license, and I can fish a whole season in Yellowstone for that price. See what I mean about the increased cost not making sense for trout fishermen? TWRA supposedly needs funding and a lot of it. Okay, I buy that. I know from my own observations that they are understaffed as it can be really tough to find a wildlife officer when you need one. They are simply stretched too thin and increased funding should theoretically solve that. Unfortunately, by increasing license fees, they will ultimately sell fewer licenses and thus may not obtain much additional funding. A much better alternative would be for the Tennessee state legislature to pass legislation that enables TWRA to keep the majority of ticket money from enforcement actions. That would both encourage officers to get out there and enforce the rules and simultaneously improve fishing (and hunting) by making sure everyone plays by the rules that are in place. In addition, as trout fishermen, we need to look at what people would pay for licenses in other destinations. 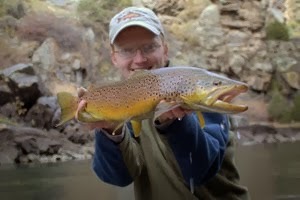 I have been fortunate enough to fish in Arizona, Colorado, Montana, Utah, and Yellowstone National Park in Wyoming. I have enjoyed fishing in each and every one of those. In Colorado, an annual non-resident fishing license is $66. In Arizona it is $55. 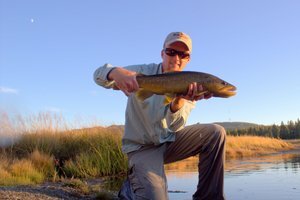 In Montana, the Mecca of trout fishing, a non-resident license is $70. Utah's non-resident license for 1 year is $75. In Yellowstone National Park, I can get a season permit for $40. Currently, in TN, a non-resident license is $81. Our fishing is better than that in Arizona, but not as good as that in any of the other 4 destinations/states that I mentioned. One state that I failed to mention is Wyoming. Guess what? The Wyoming non-resident license (including the conservation stamp is $104.50. Can you guess which state I have NOT fished in? 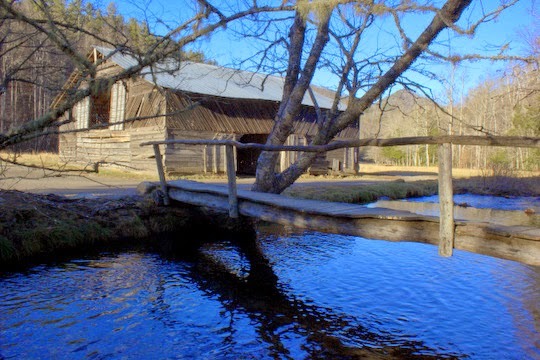 I might also add that they have incredible fishing, but I have not experienced it because the cost was prohibitive. 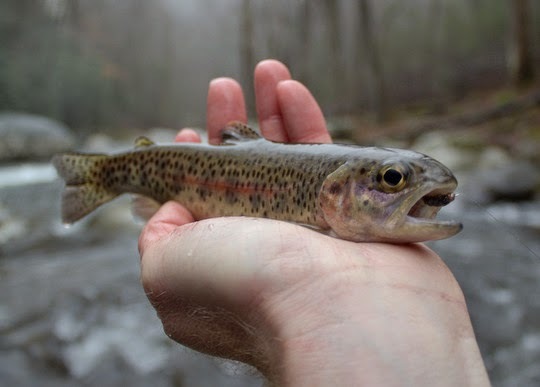 If we continue to increase our license fees, we will lose more and more business to neighboring North Carolina, Kentucky, and Georgia who all have great fishing including fantastic trout fishing. North Carolina has a delayed harvest program better than anywhere else I have seen or heard of. Again, I should mention here that their non-resident license is less than half of what we currently charge (to be fair they are also increasing license costs this next year from what I have heard). Finally, one proposal that I am torn on but ultimately oppose is the proposed guide license. The cost is not terrible prohibitive unless there are additional costs associated with getting "certified," but that is not my main concern. A little history would be best here. I started Trout Zone Anglers at the beginning of this year. Already approaching my own year anniversary as a fly fishing guide, I could not have done this except in Tennessee. Let me explain further. Living and teaching in Colorado was an incredible experience, and a large piece of me misses it terribly and not just for the great fishing and mountains. However, when my job status became murky, and I started looking around for something other than teaching, I knew that I could not stay in Colorado. 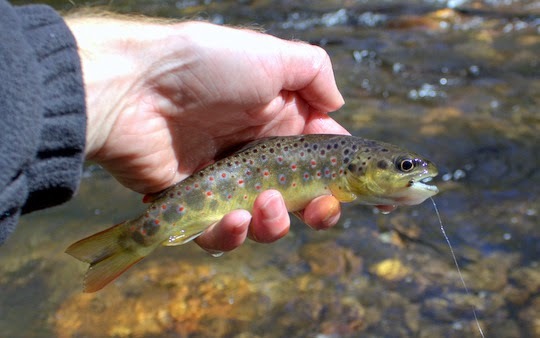 Starting a business as a fly fishing guide in Colorado was impossible. Literally. You see, the cost was prohibitive and there just weren't permits available to guide in certain areas. Things are very heavily regulated. Just to obtain a guide license in Colorado (never mind insurance or fees from various government entities to guide on specific waters, etc) was going to run me hundreds of dollars. In other words, the barriers to entry to the guide profession were significant. Of course, I could have started guiding for an established business, but with bills to pay I couldn't afford to start on the lowest rung and take just a few trips here and there. The cost of living in Colorado meant that I couldn't afford to follow my dream of being a guide there. Returning to Tennessee meant I had a chance, however. 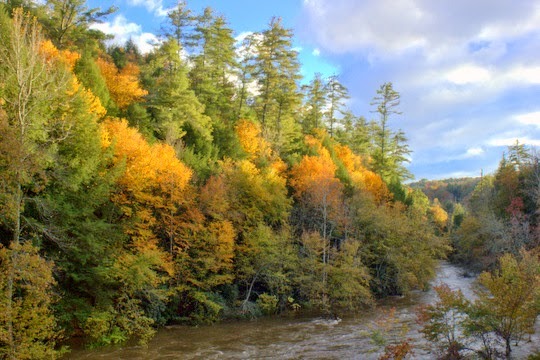 Arriving back in my home state to start guiding on the waters I grew up fishing, I had just enough money to get important things like insurance and a Commercial Use Authorization to guide in the Great Smoky Mountains National Park. Things were so tight that an additional "state" guide license would have been more than I could afford at the time. As a guide, I recognize the value in making sure that the playing field is level. I believe everyone working out on the river should have appropriate guide liability insurance as well as 1st aid and CPR certifications. Guides should be good stewards who teach clients to respect the environment and the quarry and to clean up after themselves as well as others who are less educated. While my politics are not relevant to this discussion and even my students never knew which political party I supported (if any) because I think everyone should make informed decisions on their own, I will say that I appreciated the fact that Tennessee was a conservative state when I decided to become a guide. Without the lack of barriers to entry in the guide profession, I may very well have ended up in some field that did not suit me, living the rat race of corporate America. However, here in Tennessee, the idea that any individual willing to work hard enough could be successful still lived strong enough that I was able to start my own business. Thanks to all of my great clients and now friends, my first year as a guide was all that I had hoped it would be and then some. Having learned a lot and hoping to be even better this next year, I'm eagerly looking forward to a great 2015 and already booking trips into the spring, but again, none of this would have been possible if it had cost just a little more to get started. The whole point of this background history and discussion is this. I have lived in states where you had to pay for everything in terms of access and license fees. I have also lived in Tennessee where fees are only just now on the rise. 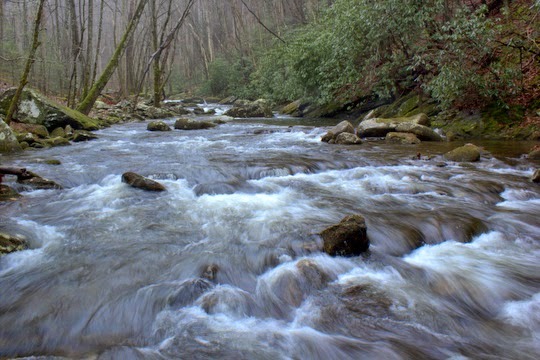 More and more Forest Service sites will be charging money for use, the Great Smoky Mountains National Park forced through a "Backcountry Use Fee" despite huge (and continuing) opposition, and now TWRA wants to further raise license fees. If you don't think this sounds bad, wait until we also have to pay for entry into our state parks. I have seen where this ends up, and unfortunately here in Tennessee wages are not high enough to reasonably allow everyone to participate in outdoor activities if there is a large fee attached to everything. For years I have camped less and less just because the cost is prohibitive and went backpacking as a reasonably priced alternative. So much for that idea with the fees in the Smokies. A basic economics class will teach you that by raising the cost, you will eliminate some people from buying a given product. This is not rocket science here. What we need in outdoor sports is more participants, not fewer, or we will eventually be eliminated. We need more education, yes, but not fewer people enjoying things like fly fishing. There are already elements within the National Park Service that would ban all users and leave the land wild for the animals that live there. A noble thought if you are a wild animal, but imagine the day when we cannot even enjoy our own wilderness. I live and breathe wilderness, clean water, and crisp, clean mountain air. We need more people who do the same. Additionally, the introduction of a guide license will eventually lead to higher guide license fees and ultimately all of that will be passed on to the consumers, those of you who book guide trips. I'm already embarrassed when I explain to potential clients how much they will have to spend on a fishing license. 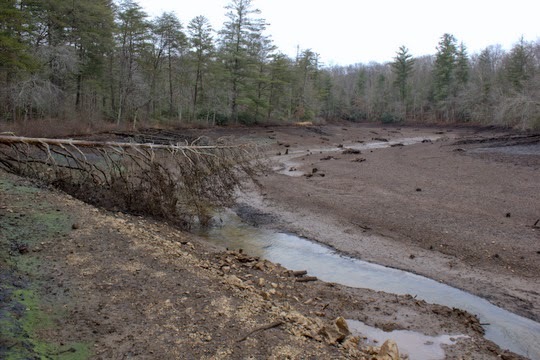 Some have been shocked already at how expensive it is now and if you have been used to fishing North Carolina's fantastic delayed harvest waters, it would be quite a shock to come to Tennessee. By regulating guides, they are simply chipping away at another small area and eventually the sum of all these concessions will be great. Remember, once things are taken, once prices are raised, once rules are implemented, there is no going back. For that matter, how will they even define the term "guide"? For example, I'm a guide who also fishes for fun. What if I'm out with my buddies on a Tennessee river and we get stopped. When asked if this is a guide trip, I honestly reply no. Then what? I'm sure plenty of people will simply lie. Then the honest ones get screwed by paying more and the others are still out there. Based on the sheer number of people using our waterways, I guarantee they will not have the time to investigate every trip to see if it is really a guide trip or not. As usual, the honest ones get a raw deal. Finally, as long as we are making changes to the regulations, Tennessee needs to make all annual licenses good for one calendar year from the date of purchase. Having fished in states that do it this way, I can really see no good reason that this is not possible. If they are going to change the rules, at least change rules that actually help. Now for perhaps the most annoying part of this whole discussion. TWRA has been very crafty and has sought no public input on the proposed changes, a real taxation without representation if you will. The goal is clearly to sneak all of these increases through with the least amount of public outrage possible. Towards this goal, the January meeting where this will be discussed is scheduled to happen in Union City. Anyone know where that is? Probably not many of you do without consulting a map. 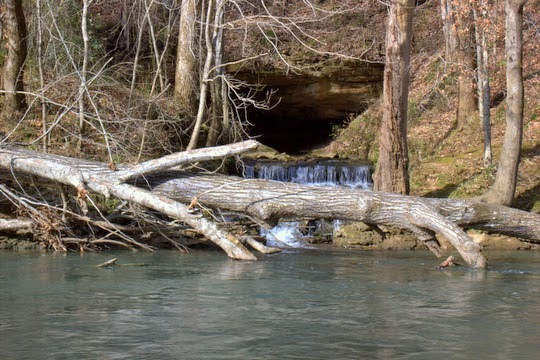 Union City is about as far in northwest Tennessee as you can get and much too far for most of the state's sportsmen to drive to attend so their voices can be heard. There are no public comment meetings in the evenings, just the one commission meeting happening at 9:00 a.m. on a Friday morning in the middle of nowhere. 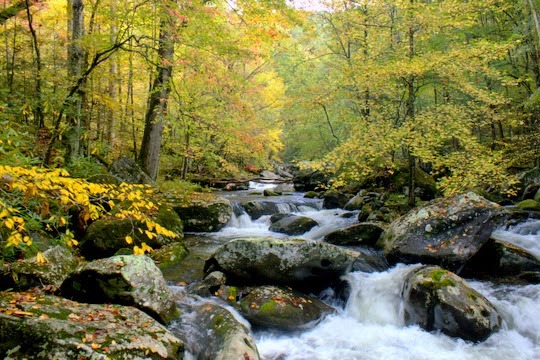 The message is clear: TWRA really does not care about Tennessee sportsmen or their opinions. They are far more interested in raising fees instead of starting a dialogue on how we can address the funding issues in a more meaningful manner that will have a lasting impact. My recommendation is for each and every one of you to contact the members of the Tennessee Wildlife Commission and let them know that you oppose the fee increases. You can find all of their contact information here. Both emails and phone calls would be a great idea for as many of them as you can. The best idea to email would be to just copy all of them on the same email. There is very little time left to act here, especially since they are making it difficult for us to be heard. I know it will take some time, but if you care about hunting and fishing in Tennessee, please take the time to let them know that you oppose the fee increases and guide license. One of my favorite things in fly fishing is seeing someone catch a fish for the first time. Kids who are picking up the long rod for the first time and even seasoned anglers catching a new species all enjoy the experience so much that just being around is fun. Yesterday, I had the privilege of spending the day on the water with my buddy Dan from Little River Outfitters. He has been dying to catch a musky, and I had some time free and an idea of where we might catch one. We met up and hit the water early enough that it was still pretty chilly out. The adventure almost got off to a bad start when I nearly didn't get off the ramp with my car/trailer (minus the boat of course). Recent wet weather had really messed up the top of the short ramp with a deep ditch cut by runoff. Thankfully, after more suspense than I really care to have, the car eased on up, and I was able to start breathing again. Soon we were drifting and Dan was throwing big flies looking for the toothy critters. The early part of the float was pretty slow. I suspected that we would start seeing fish after the first couple of miles. Slowly floating down, we enjoyed the nice day and the warmth of the sun that was not just making it more comfortable for us but hopefully was also warming the water to turn on the musky. We both started wanting a snack at about the same time so I pulled the boat over and we got out to stretch our legs on firm ground for a little while. I also got busy with the camera. As soon as we started floating again, Dan had 3 strikes in a row off of the same bank. We never did get a good look at the fish but were glad to see the action picking up. Continuing down, we got close to the section I wanted to really hit hard and I decided to take one more turn in the casting brace before getting Dan on the prime water below. Just a few feet further down the river, I had cast up into a big back eddy and was retrieving the fly when a familiar shadow appeared behind the fly. I started speeding up the retrieve and the fish charged on, unmindful of the boat. Going into my figure 8 motion, the fish shot past, only to come charging back. Unfortunately I made a little more commotion than I should have with the fly rod in the water and the fish bolted at the last second. My buddy Dan was going crazy at this point. "Did you see how big that fish was?!?!? he asked. His eyes got even bigger when I told him that it was a small to average fish, probably around 3 feet long. I kept casting a little bit longer but as we closed in on the prime water, I insisted that Dan get back in the front of the boat and it didn't take much urging on my part. He was ready now after seeing that fish chase. The wind was starting to pick up and the clouds were lowering as rain moved closer. It was now or never. Dan was working a large pool, casting to logs and other structure. Finally he turned and started working the far bank when I heard "There he is!" Almost immediately the line came tight and the battle was joined. I started rowing after the fish and it was a strong one. Dan had the 8 weight bent over more than I believed was possible and the fish would not give up. Several runs later and some lucky oar work thrown in for good measure, we had the fish in the net. Dan was pumped, and I have to admit I was as well. These fish never get old! We pulled over for the obligatory photos. Soon the fish swam off, still incredibly strong considering the battle we had just enjoyed. Minutes later, the rain arrived and we did not see another fish the rest of the way. Still, getting a musky in the boat rates as a great day and we both had more than enough energy for the ride home. I'm sure we'll be hitting it again sometime soon and I'm positive we have a new convert to musky fishing. These fish have a way of getting in your blood. 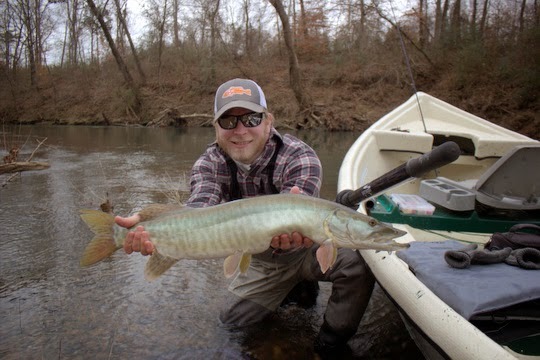 Around here in Tennessee, some of us fly flingers have taken to fishing for musky on occasion in the colder months. 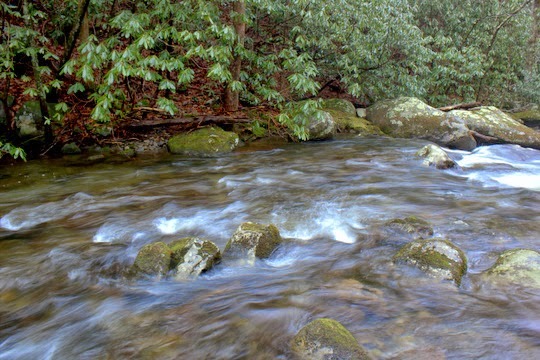 When the weather is warm, it is hard to pry ourselves away from the trout and smallmouth fishing. However, as soon as it gets cold enough to have the freestone trout lethargic, we gravitate towards either chasing trout in tailwaters or trying some new stuff. Well, it is about time to start trying some of that new stuff for this year. I've tied a few monstrosities that I hope will look delicious to a musky. There are a lot of patterns out there that people have invented just for these critters, some of which are so giant that I think my arm would fall off if I had to toss it all day. Still, when you see a huge shadow materialize behind the fly, it is hard to not think that you need some larger flies. Normally I throw stuff that would be small to medium sized compared to what a lot of musky guys are throwing. My most recent ties are a little larger than some stuff I normally tie but still nowhere close to being as large as what a lot of people like to throw. I'm just hoping to see some fish. Catching them will be a bonus on this first trip of the year but before winter is too far gone, I hope to find some monsters! One of the most important lessons any fisherman can learn is to always be prepared. As a fly fisherman, it is easy to take this to the extreme. This is why we have boxes and boxes of flies that we rarely if ever fish, instead opting for the same old Parachute Adams or Yellow Stimulator. Of course, when you are always prepared, you can effectively fish any hatch that comes your way. I've had to learn this lesson the hard way more and more than once I might add. On a recent float with David Perry, I showed up prepared to toss streamers the whole way. On the spur of the moment I tossed a 5 weight in the boat just in case. Of course, when we found fish rising to midges I remembered that my midge box was back in the car. Oops. One good thing did come of this trip. At some point we rigged that 5 weight up with a bead head nymph and one of those pinch on indicators. Then, at the end of the day, I just kept the whole thing rigged and ready. Well, I fished that rig a few times over the last week or so. I caught some panfish at Cumberland Mountain State Park, and a nice big delayed harvest rainbow on the Tellico. All of this was done in between the episodes of high water. Fast forward to yesterday. 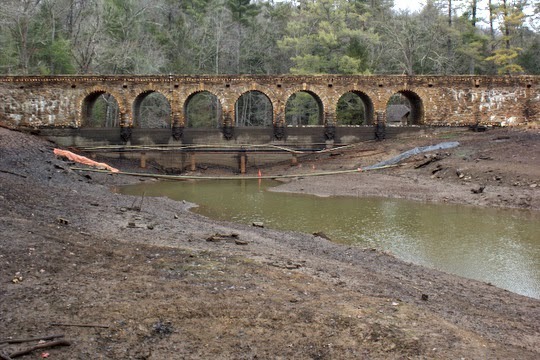 I'm heading down to Chattanooga for a few hours and as I'm driving along, I remembered reading something about a delayed harvest stream right along my route! Can things get any better? Well, yes and that is where being prepared comes in. I had that rod still rigged and ready to go. It didn't take me too long to figure out that I should probably just stop and do a quick investigation. Fifteen minutes later, I had landed 3-4 rainbow trout and was back on the road after one of the better detours I've ever taken while out driving. Never even got my feet wet either. That rod is still in my car. In fact, I'm contemplating a trip over to Cumberland Mountain State Park again this afternoon and if I make it over there, it is always better to be prepared. Of course, I might end up just taking the camera for a walk which is great as well, but if I see trout rising, I guarantee I'll be ready. Today is cold, windy, and a bit damp. Sounds like perfect weather for staying home, tying some flies and maybe having a hot beverage to help keep warm. I'll be tying some musky flies for a trip I'm hoping to do within the next week. Stay tuned for more on that! As I peruse the area stream flow gauges, I see that Little River is down into the low 40s for water temperature. The flows are actually very good, but with the trend towards colder weather I'm willing to bet that the fish are a little off today. Earlier I received a report that Newfound Gap Road is temporarily closed due to snow and ice so don't think about driving over the ridge today. The colder weather should hold on for a few days but by next weekend we should see decent conditions for fishing again. Area tailwaters are running high across the region so check the generation schedule before heading out to fish. 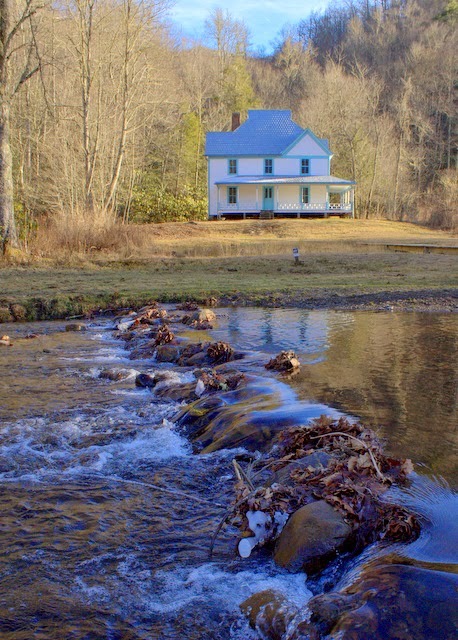 A good alternative to the wild trout streams are the delayed harvest streams. Even when it gets cold these streams fish reasonably well. 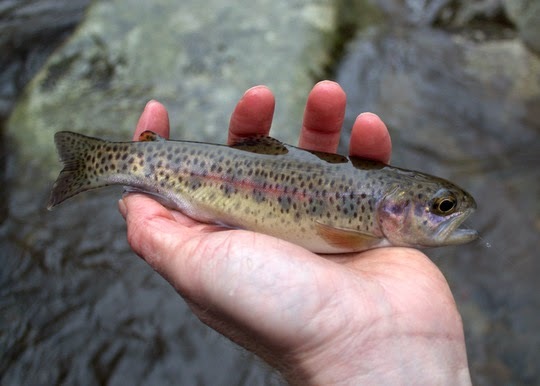 That is because the larger stocked trout still have to at least maintain their body weight. 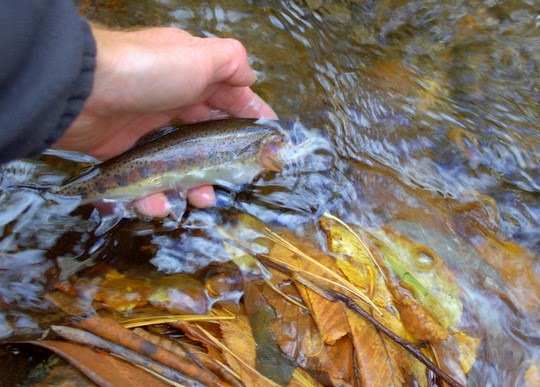 Last Thursday I did some exploring around the Tellico area and found a good number of rainbows. I caught several 10-14 inch fish on Wooly Buggers and Pheasant Tail nymphs and one that was a bit nicer. The colors on this fish were simply incredible! 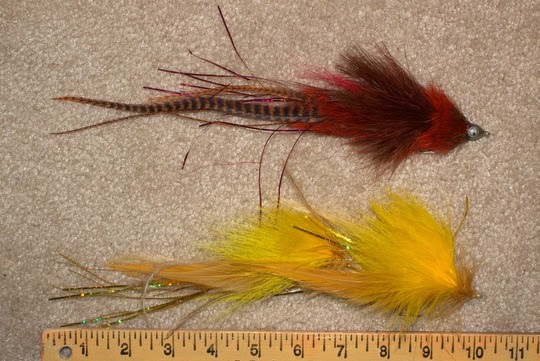 Don't be afraid to impart some action to the small streamers but the nymphs should be fished dead drift under an indicator (this can work for the wooly buggers as well).